I have just landed in Portland and, no surprise, it is raining. It is only half way through the year and Oregon has got two inches more than its annual average rainfall so far. The rivers are full, so full that my cycle tour (wet) guide asks me to dismount and lift my bike up a foot to get on the floating walkway that has risen a foot over its access ramp. Portland is best seen by bike because it is one of the few American cities where cyclists are not treated as some sort of oddity. Those that say San Francisco is European have not been to Portland. It is Amsterdam (or Copenhagen) on the Pacific. The city is small and manageable with European size blocks, well-planned 15-minute neighbourhoods and mixed use development and a great train service, the Max. It will bring you into the city centre from the airport in 40 minutes for two bucks. The streets have something of San Francisco’s world championship collection of homeless men, although less menacing. The city’s signatures include its foodcarts and its bicycles, an Amsterdam of the north west, and the best bookshop in the USA, Powell’s. The oddities are around every corner, the only Chinatown with no Chinese, the strange public art piece the Zoobon pile (bicycles arranged around a plinth), the smallest park in the world (with an Irish angle, it was home to an endangered leprechaun). Oregonians are proud of how environmentally aware they are, so somebody got an entire skid row hotel and recycled it. The Ace Hotel is now one of the trendiest in town despite the fact it looks like it has been furnished out of a skip. I stop by the Crystal Hotel to meet Mike McMenamin, a hotelier and philanthropist with a Tyrone grandfather who owns 58 properties of which 24 have their own brewery. He proudly shows me the music venue and talks enthusiastically about his trips to Ireland. My kind of guy. Later in the week I worked my way through his wines at Edgefield and the whiskies that are distilled there (one, the Devil’s Bit, is only available on St Patrick’s Day each year). To the road. The guys at Enterprise Rent a Car give me a Dodge with a stern voiced GPS. She doesn’t lead me astray (last one had a sense of humour). Driving around a corner on Santiam Pass my breath is taken away by the beauty of the panoramic volcanic stage-show. Then it happens again. The snow snuggles on Mount Washington’s sugar-loaf summit as I drive south. The lifts are closed on Mount Bachelor but Cathy Carroll in the High Desert Museum says I should hike up and ski down. Her museum has the best volcano room I have ever seen, the story of how the quilt was used as currency in the old west, a lynx that was declawed, a skunk that was de-scented, how Crater lake is not a crate at all but a Caldera, and lots of artefacts, debris in other words, that tells the story of the Oregon Trail. James Davison, the world’s leading authority on the Harris Hawk, comes by to tell me about the wildlife of the high desert. I feel like I have just come out of an old matinee movie, fired up with the images and smells of long ago. But as Cathy Carroll pointed out, the Oregon trail is less realistically defined by the black and white matinee movies of our youth than the modern video game, where everyone dies of dysentery. You have to like a city where the lead story in the sports section of the newspaper is about angling: Go with the flow: Spring thaw brings changing conditions in Central Oregon rivers. Bill Willits is my host at Five Pine Lodge in Sisters. The air is so clear it hurts. The view is stunning and the lovely Erin Borla hosts me at dinner. Bend, Oregon, is a tasty little town in a beautiful part of the world. There are river otters, a key sign of the cleanliness of the mountain stream at the end of the road where my trendy hotel, the Oxford is located. There is also a championship collection of breweries, so I stop by four of them, Silver Moon, McMenamins in the Old St Francis School (where two great Cork born pioneer priests are commemorated), Boneyard Brewery and the Cascade Lakes. Real beer with real ingredients as opposed to the rice sugar they use for Budweiser and the corn sugar they use to make Coors. There are 97 breweries in Oregon. Why? Because 80pc of hops are grown in Oregon or Washington. It makes cents as well as sense. “We like our hops big, we like our wine big,” Tyler says. 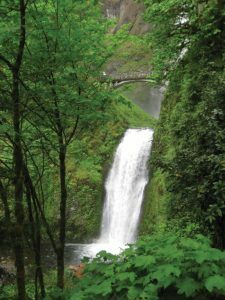 On the way back to Portland I drive over Mount Hood and stop by the Columbia River Gorge, where the water is thundering over the Multnomah Falls, and I can stand in the dew of one of the great natural wonders of the world. Someone said there is a water shortage at home. Attitude explains Oregon. As well as the landscape, the Crater Lake, the amazing Multnomah Falls, the string of sugarloaf volcanoes, it is the people that make the difference. By now the conviviality is catching. In the Teardrop Lounge I taste the Bamboo Groove with Japanese whiskey – “lovely, meditative, a cocktail haiku”. Both are in the Pearl District which was hopping with art-loving First Thursday crowds. Portland is not European at all but something more delicious, Asian-American with a little pretend Europe in the mix. A last call of duty in Portland – the grave of a great Kildare man. In Portland’s Mount Cavalry cemetery, the stones are speaking again. It is late evening, and they speak every day. Some days some stones speak more than others. The man who helps them speak has just provided me with a map. Tim Corbett and his dog have welcomed me to the office and listened patiently to my request to help locate the grave of John E Dempsey, the pugilist. He calls to an assistant. The map comes with its careful notations, sector E 124, grave 4. Tommy Conneff is buried in the Presidio in San Francisco a few hundred miles downcoast. Now here is the first middleweight champion of the world, in a quiet, scenic and lush green cemetery. Two great Clane men resting on the west coast of the USA. Corbett is waiting for me on my return. “My father said we were related to another great Irish boxer, Gentleman Jim,” he says. So unlikely. So astonishing. So Oregon.